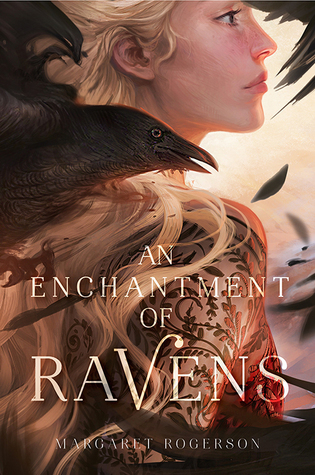 An Enchantment of Ravens is a pretty standard Young Adult fantasy novel as far as the genre is concerned, but it was also exactly what I needed. Telling the story of a young woman who runs afoul of the immortal fair folk, the book featured just the right balance of magic, beauty and romance—and if the premise itself might sound a bit conventional, at least the plot was fun and always kept me entertained. Our protagonist, Isobel, was only twelve years old when she began painting portraits for the Fae. Although they can live forever and are capable of creating breathtaking displays of glamour and other magic, the fair folk lack the ability to perform human Craft. Anything that requires art, design or construction—whether it involves writing a play, weaving cloth, or even baking bread—they simply cannot manage without all their efforts turning into dust. And so, this leaves the Fae with an insatiable thirst for incredible talents and skills like Isobel’s, and as a result her services have become highly in demand. Paying her with enchantments instead of money, her Fae patrons have helped Isobel support her aunt and two adoptive little sisters with their charms ensuring that they will always have food, shelter, and safety. But then one day, Isobel is visited by Rook, the Autumn Prince—the first royal Fae patron who has ever contracted her for a portrait. Wanting badly to please Rook, she paints the prince exactly as she sees him, inadvertently capturing the mortal sorrow in his eyes, thus exposing his weakness to the entire Fae court. Furious, Rook kidnaps Isobel, dragging her back to his autumnlands to be tried for her crime. Along the way, they are harassed by all kinds of hostile creatures, from the minions of the Alder King and the Wild Hunt to the horrible barrow monsters that prove a match for even a Fae prince like Rook. Before long though, the two of them are beset with worse concerns. Relying on each other for their survival has resulted in Isobel and Rook growing close, but love between a human and a Fae is strictly forbidden, leading the couple to face some difficult choices. I wasn’t all that impressed with the overarching plot, to be honest, for stories about young women being whisked off to the faerie realm by their kidnappers-turned-lovers have been done to death, and An Enchantment of Ravens does not deviate much from the usual themes. The romance didn’t sweep me off my feet either, and I was actually annoyed with Isobel at the beginning for becoming smitten with Rook so quickly. Also, both are saddled with such terrible emotional baggage from their pasts that I felt any chemistry between them was snuffed out before it could even begin. That said, I still had fun, because it’s the little details that makes this book such an enjoyable read. For one I loved the fact that Isobel is artist, and her reverence for the craft made it easier to relate to her. I also quite liked how the Fae would compensate her for her paintings with enchantments, leading to some interesting forms of payment—like guaranteeing a certain number of eggs laid each week by the farm’s chickens, or a cord of firewood magically appearing on their doorstep every month. Being the resourceful young woman she is, Isobel has found a clever way to help her family thrive, though it means having to be extra careful with her wording when it comes to asking the Fae for her fee. The fair folk can’t lie, but they are still very devious and they like to play tricks on humans unless every possible loophole is covered. Against my better judgment, I also found that I liked Rook. When he initially made his first appearance, I thought for sure he would be one of those insufferably arrogant and broody Fae princes, and for a while it really felt like that would be the case. The truth, however, came about once he and Isobel started journeying towards the autumnlands, especially following the attacks from all kinds of monsters while they were in the wilderness. In the face of these dangers, a vulnerable, clumsy and even inept side to Rook began to surface, making him feel more genuine and relatable. The fact that he wasn’t perfect also meant that there was less of a power imbalance between him and Isobel, with both characters having to rely on each other for survival, and I won’t lie, this equal footing made the kidnapper-hostage nature of their relationship somewhat easier to swallow. Light humor in their conversations also made Rook more endearing. All told, I wouldn’t say there’s anything too “special” about An Enchantment of Ravens, but sometimes that it is a good thing, considering how many books I’ve read recently that have tried doing something new and different but ended up falling flat. At least you know what you’re getting with a book like this. I knew I wanted a fun and light fantasy about the Fae, and I definitely wasn’t disappointed. I can understand for the plot but in a whole it looks good there! I didn’t know about this one but what a nice cover! There are many interesting details in this story, not least the fact that the fae are unable to create tangible things, or the payments settled through enchantments that still require a flawless wording to avoid having the result turn against the recipient. This is a book that I really wanted I must admit. I’m still intrigued by it although in some respects it doesn’t seem to have wowed you as much as I hoped – I do like the little details about the fae and how they make their payments. Don’t like the sound very much of the instalove that seems to go on here though – it definitely is a bit of a tired trope isn’t it. Hmm, I think I am encouraged to check this out — when I need something that won’t deliver too many shocks! LOL! I’m glad you liked Rook, despite thinking that you wouldn’t like him. I adored him. 😀 I liked this book SO much more than I thought it would, mostly because it was not ACOTAR 2.0. Thank goodness for that! I’m glad you liked it overall. Great review! I’m going to see if my library will get a copy of this one. I’ve seen it compared to A Court of Thorns and Roses which I didn’t really love but I think it would be different and really like the idea that it’s a stand alone. There are not enough of those out there. I just came across this book today on another book blog and it is ticking so many boxes for me, so I’m glad to see another positive review!